409 p., 14,8 x 20,5. 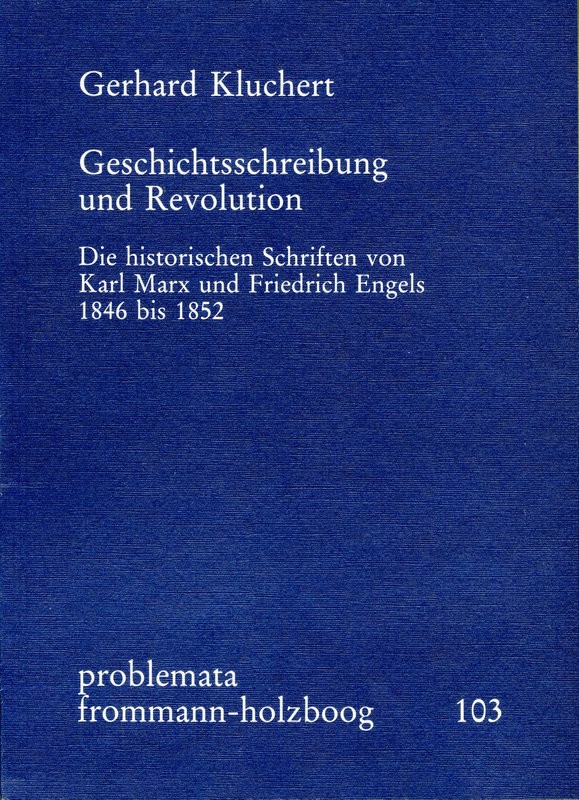 Die historischen Schriften von Karl Marx und Friedrich Engels 1846 bis 1852. The years surrounding the 1848 revolution were of crucial importance for the intellectual development of Marx and Engels. In their constant analysis of the revolutionary events, in which they themselves intervened, Marx and Engels changed the structure of their theory. One essential medium of this analysis was historiography, in which the immediate past is processed in thought while at the same time theories evolve and preparations for political action are made. – This work sheds light on the models of interpretation on which the historical analyses done by Marx and Engels are based and compares them with the concepts which governed their political actions. This makes it apparent that there were parallel changes: In the years in question the structure of historical interpretations and political concepts changed twice. Central to this was the problem of explaining economic progress and social revolution. In trying to solve this, Marx and Engels ended up taking different paths.